This information is provided for files created at home and sent using our document upload form. 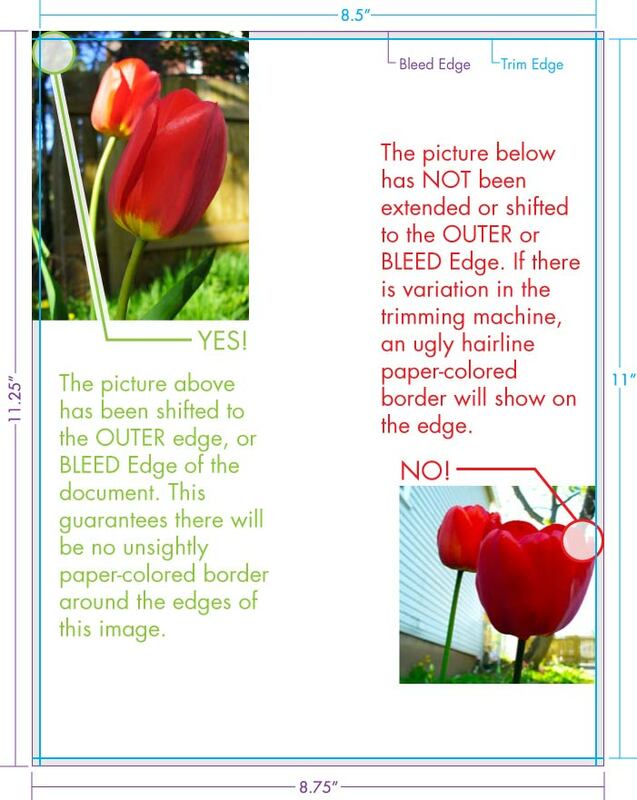 Bleeds are automatically calculated for files sent using the online print order system or photo template section. Bleeds allow you to run artwork to the edge of a page. On a press, the artwork is printed on a large sheet of paper and then trimmed down to size. If you do not allow for a 1/8 of an inch bleed, any misalignment while cutting will result with the artwork not running to the edge of the paper. Bleeds ensure you get the results you need (see an example). For example, if you have designed a standard 3.5″ x 2″ business card with a red background covering the whole area, you will need to enlarge that red background to 3.75″ x 2.25″. This will make the red background extend 1/8″ on every side of the page. Why is adding a Bleed necessary? Small mechanical variations can end up leaving a hairline white edge where there should be no white edge at all, if the image is not extended beyond the final trim size. Extending images 1/8″ beyond the final trim size guarantees that images truly will go all the way to the edge of the printed paper. How do I add bleed to my design? © 2019	Park Agency / Xanu Inc. All rights reserved.